Brian Jones has over fifteen years experience helping organizations achieve real results in the areas of organizational and leadership development. 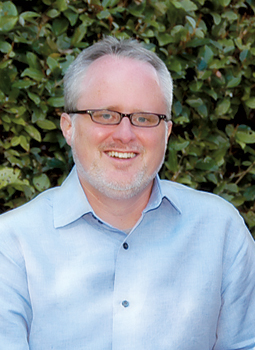 As Director of People Development at Baptist Health Care in Pensacola, FL, Brian was instrumental in that organization’s recognition as Training Magazine’s “Top 100 Training Organizations in America” for five consecutive years and Fortune magazine’s “Best Places to Work in America” for four consecutive years. Brian was also a principal creator of many tools and best practices that were key to Baptist Hospital, Inc. being awarded the Malcolm Baldrige National Quality Award in 2003, only the second hospital to achieve the prestigious award. Brian has been affiliated with Patrick Lencioni, author of “The Five Dysfunctions of a Team,” since 2005 when he was chosen to be Principal Consultant of The Table Group. Brian facilitates high-impact sessions for senior leadership teams and other intact work groups. Brian is also the co-author of the book “Ordinary Greatness” (Wiley, 2009), which helps leaders develop greater levels of employee engagement in their companies. 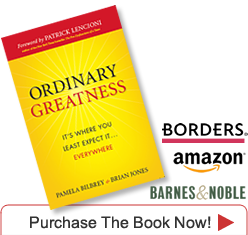 “Ordinary Greatness” was published in Chinese in 2010. Brian is a sought-after expert on teamwork and workplace issues. He has been a guest on VHA TV and National Public Radio and has been quoted recently in USA TODAY, The Denver Post, The Miami Herald, HealthLeaders, Employment Relations, and other publications. He lives with his wife and three sons in Gulf Breeze, Florida.